Martin Vogel has natural talent for invention and reinvention. Throughout his life he has had several successful careers in vastly different fields. Vogel loves a challenge and puts his heart and soul into everything he does. Vogel’s first career was as a professional motorcycle racer. He first hopped on a bike at the young age of 5, started racing at 16, and by 20 was a part of the American Motorcycle Association Formula 2 circuit. Amidst his racing career, everything changed. During a routine warm up on the Infinion Raceway in Sonoma California, another cyclist collided with Vogel, sending him across the track and paralyzing him from the chest down. This did not stop Vogel; it only fueled a lifetime of triumphs. Only seven weeks out of recovery, Vogel, began his career as a wheelchair racer, subsequently wining countless of races of various distances. An inspiration to other paraplegic athletes, he has toured Europe and North America competing, and is even a 5000 meter and 7 time world champion. In addition, he customizes and races super karts. At the same time Vogel first hopped on a motorcycle, he developed a love for creating art. He continued his exploration of art through private study and college classes at Art Center in Pasadena, California. 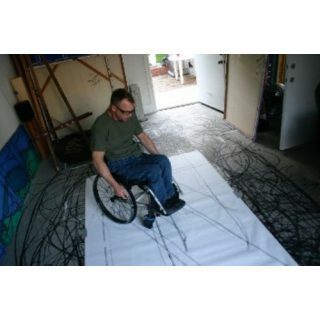 He applied his lifetime passion for art when he rigged up an old wheelchair with devices to apply paint on wheels to canvas. And so the invention of wheelchair painting began and has since inspired other artists. Vogel paints elaborate patterns with his wheelchair, some beautifully symmetrical while others more abstract, but all rich in visual harmony. To date he has completed over 800 canvases and hundreds of works for hotels, offices, and restaurants. He has held exhibitios all over California as well as in Washington, D.C. and Texas. 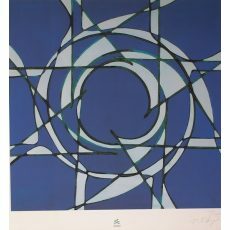 His paintings have been featured at the 2001 Olympics and the Olympic Museum in Salt Lake City, Utah, as well as at the Modern Art Museum in Riverside, California.